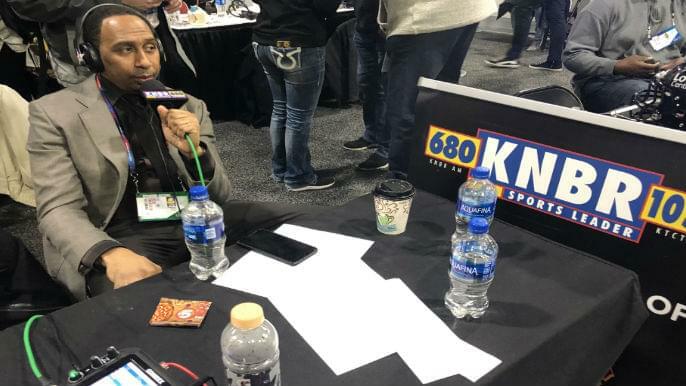 Radio Row in Atlanta for Super Bowl 53 has produced many great interviews thus far, but maybe none greater than Stephen A. Smith’s interview with Gary and Larry Friday afternoon. Stephen A. discussed Demarcus Cousins’ immediate impact on the Warriors and how he was wrong about the superstar center about how he’d fit in with the defending NBA Champs. With the return of Demarcus Cousins, the Warriors rode an 11-game winning streak into a match-up with the Philadelphia 76er’s Thursday night, where the Warriors suffered their first loss since the Cousin’s debut. But now that a fully healthy Warriors team had added even more elite talent, they look like the team that swept the Cleveland Cavaliers in the 2018 NBA Finals. Stephen A. admitted that he himself doubted Demarcus Cousins ability to return from his Achilles injury before Spring. When the Warriors signed Cousins, there were questions raised about how another superstar would fit in with a team that was already full of superstars. Cousins is known for having a strong personality, and some people thought his personality might clash with an established locker room. Stephen A. was also asked about his recent feud with Oakland Raiders quarterback Derek Carr. Recently Derek Carr took offense to comments made by Stephen A. Smith and co-host Max Kellerman when they critiqued is play on the field in 2018. “Heres the two things that absolutely pissed me off with what he said. First, Max said that about him, but he tweeted about both of us, I had nothing to do with that. Second, when he went on the show the next morning with Golic and Wingo and brought up his kids, that really ticked me off. Carr was also concerned that his kids would see him being critiqued on national television. Stephen A. Smith was angry over these comments because Carr brought his journalistic approach into question. The feud between First Take and Derek Carr is far from over, and it doesn’t sound like Stephen A. Smith and Carr will have any sort of relationship in the future. “We ain’t here to be friends.” Smith said. “I can assure you that Derek Carr will not be having Thanksgiving dinner with me, nor will we exchange Christmas gifts. I won’t give a damn, I respect what you do and what you don’t do. If you don’t get it done I’m going to call it like that, if you do get it done, I’m going to give you credit.